Plants 4-8 (-10) cm tall, pink to pale violet with white tips, axes complanate, forming bushy tufts attached by crustose holdfast. Basal 1-5 segments terete, about 2 (-2.5) mm long, about 1 mm in diameter, above that becoming cuneate and flattened and often markedly alate (winged) , 3-4 (-6) mm long and up to 6 mm wide at distal end. Branching pinnate, but sometimes more than 3 branches arising from a segment; finer branchlets of third or higher orders sometimes awl-shaped, terete or flattened. Final series of branchlets sometimes long (-6mm), terete, often pointed. Adventitious branching from faces of segments present (common in some specimens), usually from near the top of an axial segment. Genicula inconspicuous and barely visible. Fertile intergenicula (in distal parts of plant) each bearing swollen conceptacle at the top, with a single terminal ostiole. A South African endemic, recorded from Stilbaai to Hluleka (26-45). Collected from the lower intertidal and from rock pools. Type locality: “Blauwklip, near mouth of the Groote River (Keurbooms River), Knysna District, Cape Province, South Africa” (Silva et al. 1996). Note: A DNA barcoding study by Kogame et al. (2017) confirmed a distinct clade of South African Arthrocardia fitting the description of this species. 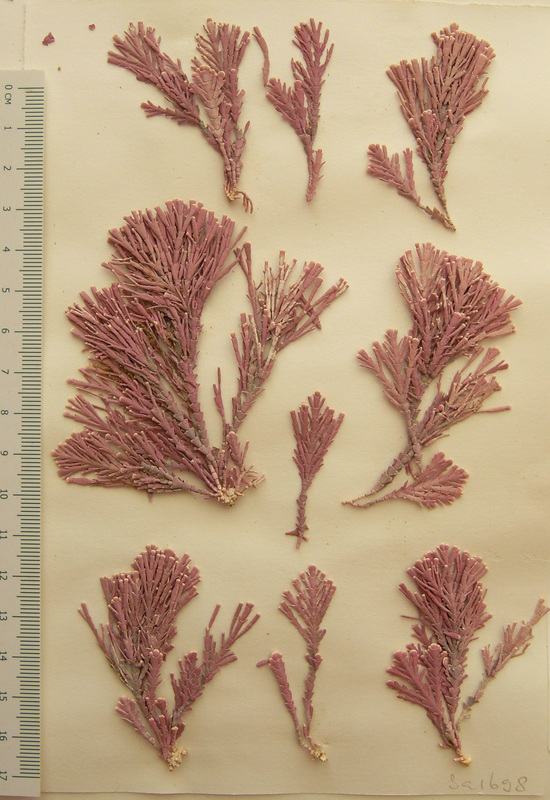 Arthrocardia duthieae, herbarium specimen (BOL). 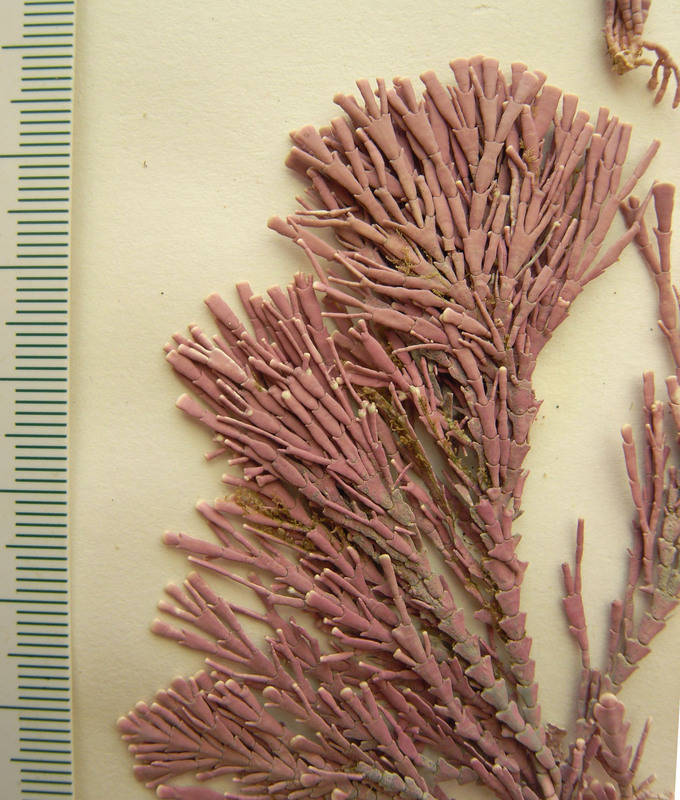 Arthrocardia duthieae, detail, herbarium specimen (BOL). Johansen, H. W. 1969. Morphology and systematics of coralline algae with special reference to Calliarthron. University of California Publications in Botany 49: 1-98, 33 figs, 2 tables, 19 plates.